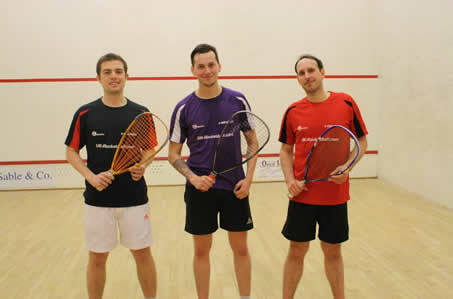 The A grade saw a very tough draw with the likes of Phipps, Selby and Jeal, all UK Racketball Series regulars. The first match of the day was to be one of the longest with Phipps battling it out with Paul Johnson who was on top form to take on the multiple event winner Phipps. In the end it was Johnson who prevailed to take the win, playing some great racketball to get there. Johnson went on to win all his other matches in his group putting him through to the final round along with Selby and Jeal making a round robin of three for the win. After a tough 2-1 win for Jeal over Johnson there was no rest for the wicked! Jeal went straight back on to play Selby with the chance to win the group, no warm up needed! Bothe Selby and Jeal have been in a number of UK Racketball finals previously so it was always going to be close. Ted Jeal continued his good form from his first match to take the win and with it the A grade title for Limpsfield. The B grade was hotly contested with Keith Mabey just scraping through group A by one point to reach the semi finals. Jonathan Round had a clean sweep in the box stages only to be beaten by Mabey in the semis. In the lower half of the draw Brendon Bennett took the win in group C and UK Racketball Series regular James Murphy squeezed out Greg Zabinski in a close 2-1 to take the semi final spot. Bennett continued his good from from the box stages and stormed onto the final to take on Mabey. The final was another close 2-1 affair with Keith Mabey just coming out on top of Bennett to take the Limpsfield B grade title. The women's format was a round robin with 5 players competing, including the 2012 Limpsfield Champion Kathryn Milne.There were a number of close matches with the decider being between Milne and Mount who fought it out right to the wire. In the end it was Milne that used her home advantage and took the win 2-1 to leave her just one point ahead of Mount and victor of Limpsfield for the second year running. The Over 40’s saw a large entry of 16 players with top contenders in every one of the four box groups. Whoever was going to win this grade was going to have to work very hard, all day. After the dust settled from the box matches it was James Powely, no 1 seed, vs Andy Murray in the top half of the draw and Rob Watkins vs Jason Russell in the bottom half. Both matches saw some epic racketball with Jason Russsell playing some outstanding shots with consistency and accuracy to contain the trickery and racket skills of Rob Watkins allowing him to grind out a close 2-1 win. In the other half of the draw it was Murray who took the game to Powely and came out on top to put him through to the final. The final was again another long battle with both players really going for the win. After a long day of racketball it was Andy Murray who was able to work his opponent harder taking the legs of Russell and with them claiming his first UK Racketball Series Title. The 50’s saw some familiar faces and some serious competition right from the outset. The semis saw a number of very close, tense matches ensue with Buzby Williams and Terry Jeal battling it out. In the end it was Williams who maintained his composure and ruthlessness to take the win 2-0. The bottom half of the draw saw Paul Fennel taking on James Murray in a very clos affair with Fennel just pulling out the win 2-1 to claim the final spot. After a serious battle in the final it was Buzby Williams who took the win over Fennel to claim the over 50's title for Limpsfield. In the newly created over 60’s category for 2013 we saw National Champion Ian Graham and Series regular Graham Greensall on opposite sides of the draw. Nither player disappointed with both progressing with clean sweeps straight into the final. Greensall put up a strong fight against Graham, but despite pushing him hard, it was the National Champion Ian Graham who showed his strength and superior skills to take the win 2-0. The beginners grade was a great event with a really strong entry of 12 players making for a fun day of racketball. After the four box groups it was Wilson vs Venter and Stockham vs Jackson in the semi finals. Venter proved to be the stronger player in his semi match storming through 2-0 to put himself in the final. However Stockham vs Jackson was a much closer affair and after a close 2-1 it was Jackson the moved through to the final. In the final it was Gerrit Venter that continued his good form taking inspiration from his earlier matches to win 2-0 claiming the Limpsfield title for the beginners. Limpsfield will again be hosting the first UK-Racketball event of the year in the South of the country. Last year saw over 80 players taking part and the club finished second on the poll of our most liked club. With a proactive committee and thriving Racketball section, the event in May is eagerly anticipated. Limpsfield will again be hosting the first UK-Racketball southern event of the Series. With a proactive committee and thriving Racketball section, the event in May is eagerly anticipated. Last year the venue received one of the highest entry levels with over 80 players and came 2nd in our end of year “most liked club” poll. Limpsfield is a premier club in the squash and racketball world with several squash teams in the Surrey league including the PSL. With a local sponsor and many keen members willing to help on the day, this year’s Limpsfield Racketball Open looks like one not to miss. Limpsfield local players picked up several home titles at last year’s event and it became known as the ‘Maker of Series Champions’; Ted Jeal opened his account at this event on the way to becoming 2013 UK-Racketball Series Champion.